For the second half of our trip we drove from Tamarindo back to Liberia, took the Pan American Hwy south to Canas and then northeast on a very narrow, curvy, steep up and down road around the north shore of Lake Arenal to La Mansion Inn Arenal where we stayed for 3 days. Drive time nonstop 3.5 hours, 101 miles distance, average speed 29 mph. Lots of complaints about how fast we were driving. Most of the curves are so steep and tight you barely miss the rear of the car while constantly upshifting and downshifting to try and control the speed. Driving around the lake was quite interesting as the road sides were very steep (mostly almost straightup on one side of the narrow road and straight down on the other) and often half or more of the road had slide down the mountain . A sign replaced the missing portion of the road and required traffic to yield to the remaining side. Often these slides were at the bottom of a steep hills in tight blind curves. Made night driving very interesting. 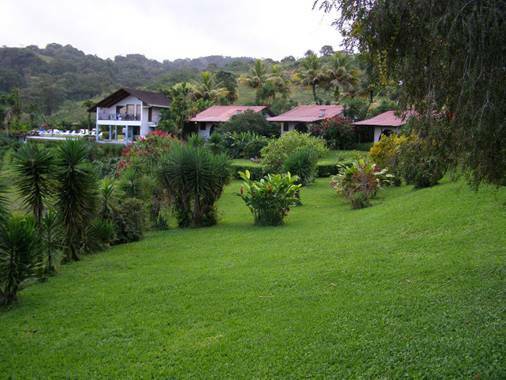 The lake sits at the base of Arenal Volcano in the northern highlands of Costa Rica on the Atlantic side of the continental divide at an elevation of approximately 1,200 ft.. It is the country’s largest landlocked body of water, 33 square miles of surface with a depth of some 200 feet. In 1979, the lake was enlarged to 3 times its original size with the construction of a hydroelectric dam. 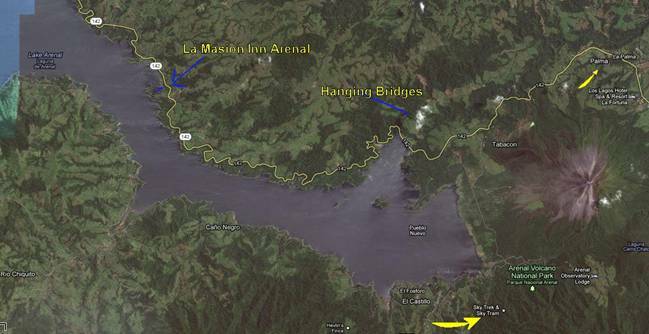 The towns of Arenal and Tondadora were relocated to the northeastern side of the lake to make room for the expanded lake. The lake produces nearly 12% of Costa Rica’s electric energy. To the east of the lake are large wind turbines that dot the tops of the continental divide and generate additional electricity. During the time we were there the clouds would roll in in the afternoon and night, it would rain off and on every a few minutes and then clear up by 9 or 10 am. Temperatures were mild making a light jacket desirable at night. 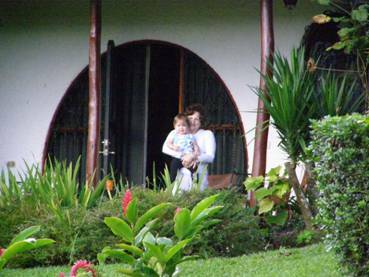 La Mansion Inn overlooking Lake Arenal consists of 17 cottages, a restaurant, swimming pool and hot tub. The landscaping was unbelievable with many different kinds of flowers, plants and trees. There was a huge grapefruit tree (over 50 ft tall) loaded with grapefruit behind of cottage. We learned that establish-ments that sell soft drinks, food, etc. are called Sodas and one was next door to La Mansion Inn. 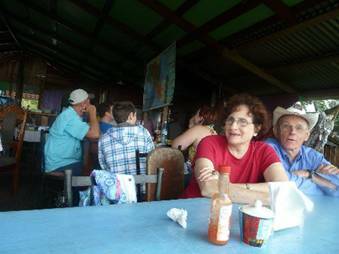 It was several magnitudes cheaper to eat there than at the Inn and the food was local and more to our liking. At right is picture of Doris and Elton at the Soda. We had a great time relaxing and playing with Ruby. She was practicing climbing up & down stairs and walking around the garden. 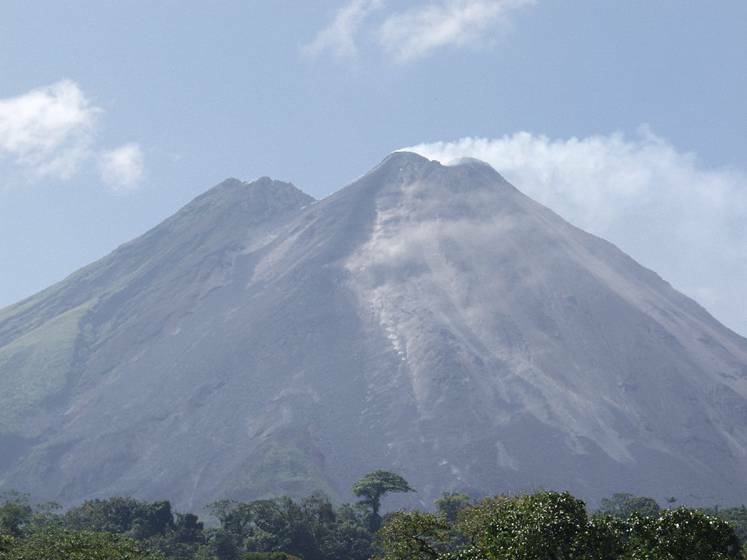 During one of our exploration trips we went to the Arenal Volcano National Park and stopped at the Sky Tram. It’s way up the side of an old dormant volcano. From there one could take the sky tram much higher up and either zip line back down or return on the tram. Zipping down consists of riding 8 different zip lines that range in length from 100 to 2,460 feet and reach a height of 660 feet above the forest. 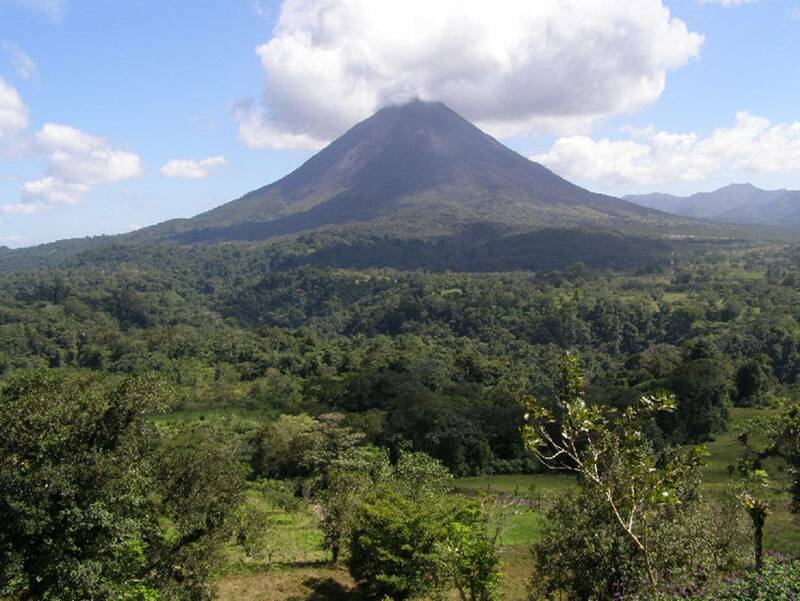 Arenal Volcano is directly across the valley from the sky tram and zipping provides a fantastic panoramic view of the lake and Volcano. We didn’t do the zip line but did get some pictures of the volcano. We made several trips in the area around the volcano. It and the lake are the main tourist attractions.